New Army Boot Regulation Confusing you? We've Made it Easy! 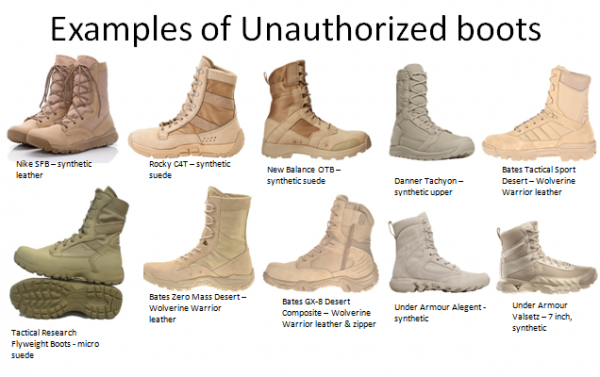 Back in March the Army’s New Boot Regulation (Army Regulation 670-1) went into effect, and if you are like most soldiers we have come across, this new regulation has made boot shopping a confusing task. What are you allowed to wear now? Where can I find it? This regulation requires that boots are between 8 to 10 inches in height and must be made out of tan flesh, rough side out, of cattle hide leather (no more of that fake stuff!). They also must have a plain toe with a rubber and polyurethane sole that is similar in color (tan) to the upper materials. The soling material of the boot cannot exceed 2 inches in height, when measured from the bottom of the outer sole, and cannot extend up the back of the heel of the boot or over the top of the toe. The top portion of the boot must meet requirements too. The exterior of the upper boot cannot contain mesh, but must be constructed of leather or a combination of non-mesh fabric. You got all that? The new change has thrown a lot of us for a loop, but adapt and overcome, right? At our store we have chosen to color code our boots to help our customers easily identify the right 'New Regulation' boot for them . Here on our online store, we have added into the description of the boots if it complies with the AR 670-1. If you would like to read more about this new regulation I have attached an informative link below. I hope this helps eliminate some confusion on this issue.